Missing Cedar Rapids convenience store clerk Amanda Daniel. 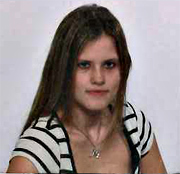 Call CR Police at 319-286-5400 with any info. Cedar Rapids police say a man entered a local convenience store early this morning and kidnapped the 19-year-old woman clerk. Sergeant Cristy Hamblin says police were called after a delivery man stopped at a Kwik Shop store on the west side of the city around 4:20 this morning. She says when the delivery man walked in, there wasn’t a clerk in the store, and he called police right away. Hamblin says they learned the clerk who was supposed to be on duty was Amanda Daniel. She says they did some checking and found out more about what happened. “She’s a great employee (who) would never just leave, so we began looking at some surveillance video and found that she had been forced against her will to leave the building,” Hamblin said. 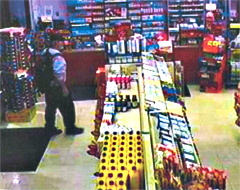 Man in store prior to kidnapping of clerk. Hamblin says at this point they are looking at it as a kidnapping. She says they are trying to identify the man involved. Hamblin says they are looking for anyone that may’ve been in the store and was unhappy, someone who may’ve know Daniel, any angle to try and find her. Hamblin says the man is an older white male, approximately five-feet-ten with a medium build, who was wearing a light shirt and dark pants. Daniel is a white female who is five-feet-five inches tall with long sandy brown hair. Hamblin says this type of case is something they don’t deal with very often. “Very rare, I’m trying to remember the last kidnapping abduction we’ve had, and it’s been a very long time,” Hamblin says. 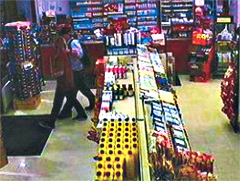 Survelience photo showing clerk Amanda Daniel leaving store with man. Hamblin says anyone who may’ve been in the area an saw something, or anyone with any information on the whereabouts of Daniel, is asked to call the Cedar Rapids Police Department at 319-286-5400. Photos provided by the Cedar Rapids Police Department.